An expert photographer-naturalist leads this immersive journey into the Realm of the Polar Bear. Your photo adventure spends three full days on the tundra where polar bears congregate each autumn on the shores of the Hudson Bay, waiting for it to freeze, so that they can start their winter hunting season. Custom-designed Polar Rovers take us into the heart of their wild habitat, with plenty of space for equipment and room to manoeuver in order to capture those magnificent shots. Your expert guide will also provide evening lectures on how best to capture Arctic wildlife through the camera's lens - notably polar bears, Arctic fox, Arctic hare and more ! Our tour begins in Winnipeg. You will be transferred to your hotel where you will meet your Expedition leader in the evening at your Welcome dinner. 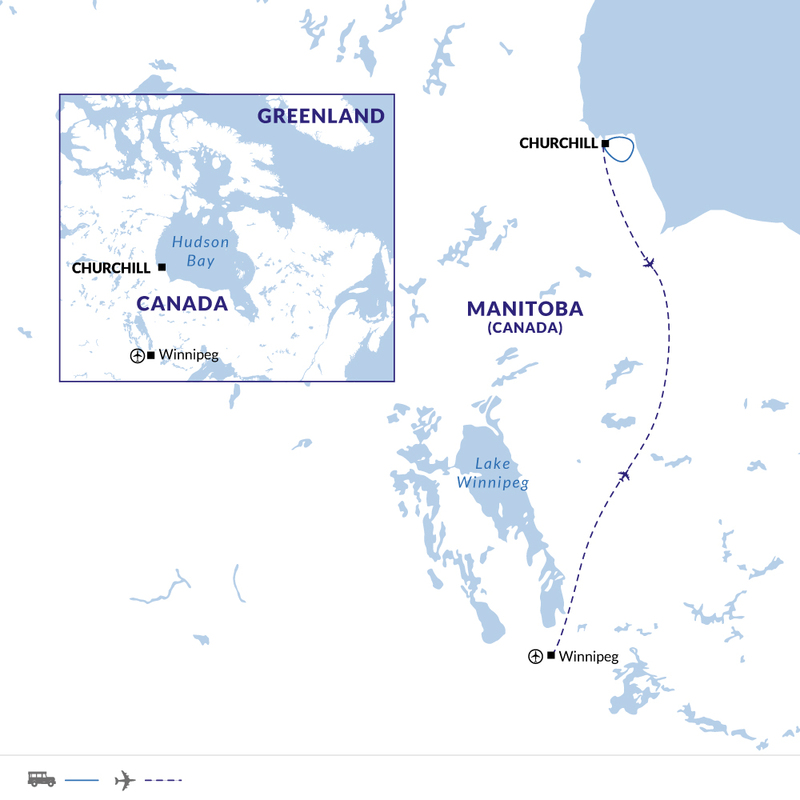 Fly to Churchill in the morning, our base for our polar bear adventure. This evening we enjoy a lecture on Arctic photography by our Expedition Leader, who is both an accomplished photographer and seasoned naturalist. Uniquely designed Polar Rovers are our mobile means for spending time amongst the bears. Although each vehicle accommodates up to 35 passengers, we take a maximum of 16, ensuring that everyone has a window seat, space for camera gear and plenty of room to photograph. For three full days, we spend our daylight hours on the tundra, photographing polar bears as they roam the edge of Hudson Bay waiting for the ice to freeze. You will be delighted by their rugged beauty and playful antics, as we watch the bears interact. From the warmth of our vehicle, we may see mothers with cubs, young males play-fighting, or a lone bear ambling over the tundra in solitary grandeur. Out on the white expanse of the tundra we may also spot other northern wildlife including Arctic fox, snowy owl, ptarmigan and gyrfalcon. In addition to sharing photography advice, our Expedition Leader will provide you with a captivating interpretation of the animal behaviour. Each evening, dinner will be followed by presentations on photography, wildlife or local native cultures. If the night skies are clear and we're fortunate enough to see the dancing colours of the aurora borealis, we'll head for a place away from the lights of town to capture this magical event on camera. You will have time to explore Churchill before boarding our afternoon flight back to Winnipeg. We enjoy a farewell lunch in Churchill and a final dinner reception before our adventure concludes in Winnipeg. Down parka and boots will be supplied for use on the trip when you arrive in Winnipeg. Please pack a Warm jacket and footwear for arrival into Winnipeg. Sizes for the loaned jacket and boots will be taken in advance, once you have booked onto the tour. Boots will be supplied for use on the trip when you arrive into Winnipeg on Day 1. Sizes will be taken in advance once you have booked onto the tour. The weight limit for checked-in baggage on our charter flight between Churchill and Winnipeg is 50 lbs. per person. As luggage space on our transfer vehicles is limited, we ask that you limit your luggage to ONE piece of checked baggage per person. We suggest one water-resistant or waterproof bag and one carry-on or daypack per person. We highly recommend packing light - take only the essentials you will need during your adventure. Binoculars - these are a must on the tundra. For optimal viewing, we suggest those with specs between 10x42 and 8x42. You may even try 8x35, but only if they contain high quality glass. Practice using your binoculars before your adventure to make sure they are not too powerful or you do not have trouble holding them steady. Couples should consider bringing two pairs of binoculars, so both people can view wildlife simultaneously. Sunscreen & lip balm (SPF15+) Bring protection for your hands, face, and lips, as the reflection off of the snow and ice can be intense. Zip-lock bags are great for protecting camera equipment. Our Expedition leaders guide nature trips because they love to view wildlife and to educate people about the splendors of the world in which we live. They are not motivated by gratuities. Rather, they take great pride in making your trip an experience of a lifetime. If you feel your Expedition crew have done an outstanding job and wish to offer a gratuity, we recommend approx. $15-$25 USD per person, per day. A portion of this gratuity is shared with local Natural Habitat Adventures staff for their assistance on your adventure. Please note, Canadian dollars is also acceptable. Canada Visas are not required for UK, US, Canadian, New Zealand and Australian citizens. From March 2016 any visitor travelling to Canada, including those who don't currently need a visa to visit, will have to get an electronic travel authorisation (eTA) to enter Canada. From 1 August 2015, travellers will have the opportunity to go online and apply for their eTA ahead of time. For more information see the official Canadian government website.